Eebie jeebie! A year ago I invested (I use the word advisedly) in new spectacles. 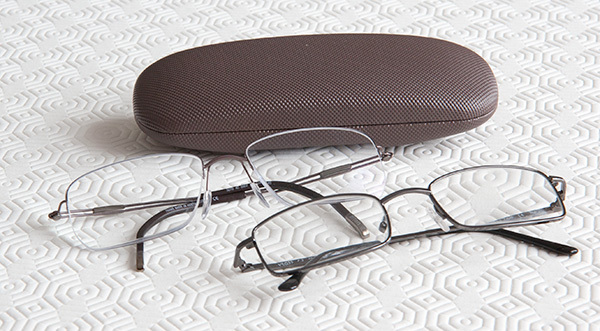 One pair cost some astronomical price so I got the second pair for next to nothing – they call it a special offer. Hmm. But hey, my eyes are beyond priceless, so they need cherishing. This week I had my next regular annual check and oh woe, both eyes need stronger lenses. Ahah! Time to capitalise on the old investment and just replace the lenses, methought. And yes, these lovely smiling gentlemen specialists assured me, they could do that in such a way that I was able to keep one pair on while the other was re-glazed, and then swap them, so I’ll still be able to function as normal throughout the transition. Perfect. However … yep, you knew there was a ‘but’ coming … even allowing for the miserly skin-flinty, curmudgeonly, option of recycling the old frames, the bill for four small ovals of plastic came to over £300! Phew! And it’s not as if everyone exclaims over one’s sartorial ocular elegance, is it? Who notices your lenses are brand spanking new? Who even recognises you’re wearing designer frames? 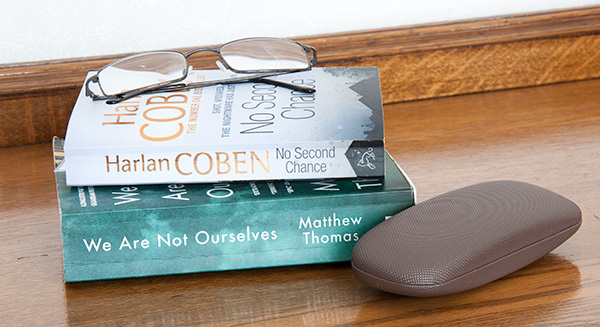 Only an optician! But hopefully my own eyes will, and they’ll return to days of intensive reading and peering at computer screens with renewed energy, comfort and ease. A precious blessing. Then much later defence lawyer Lenny Marcus says ‘I can only be as happy as my saddest child.’ Is this a universal truth? Does it apply to me? Challenging thoughts. Such is the power of the written word. You’d have to be an ostrich to miss all the attention given to mental health of late. It’s Depression Awareness Week this at this very moment. Heartening to see; we can all do with better understanding and sympathy. Since Inside of Me came out, my own working days have been much taken up with fathoming the extent of provision for adolescents grappling with psychiatric ailments and issues. I had absolutely no concept of the number (hundreds in Britain) of centres and units and teams devoted to this vulnerable group. Impressive. And all this is going on largely unsung and unremarked. 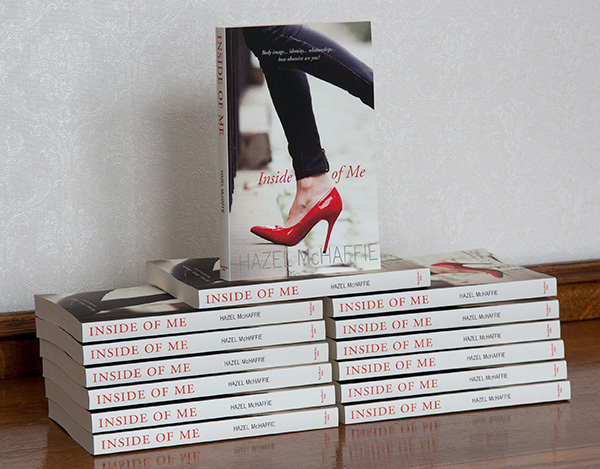 Naturally I did a stack of research before and during the writing of Inside of Me, but now it’s published I’m exploring different aspects of the topics and finding them fascinating. Not only increases my own awareness but all helps when I’m being interviewed or fielding questions at book events. There’s been plenty of exposure in the media too. The A Word, on BBC1, is currently unravelling the effect on the Hughes family of young Joe’s autism. It’s still ongoing so I won’t say too much about it meantime. But, knowing a number of people on the spectrum personally, I’m particularly interested in the reactions and behaviours of his parents struggling to accept the situation and deal with the comments and criticisms and insensitivities of other people, what it’s doing to the whole family. 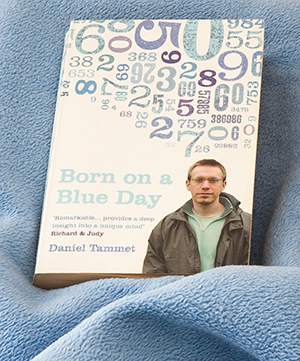 I’ve also been reading a book written by a young man who has synaesthesia as well as Asperger’s: Born on a Blue Day by Daniel Tammet. ‘I just did not seem to fit in anywhere, as though I had been born into the wrong world. The sense of never feeling quite comfortable and secure, of always being somewhat apart and separate, weighed heavily on me.‘ Not surprisingly Daniel craves order, security and predictability; but in many ways his life is outstandingly vibrant and uniquely different. Numbers are never far from his thoughts no matter where he is or what he’s doing, but he sees them as shapes, colours and textures. Calendars delight him – all those numbers and patterns in one place. On the other hand social interaction is problematic, but if a person reminds him of a number he feels more comfortable around them. Daniel also has savant syndrome for which he has become a minor celebrity. He can perform extraordinary mathematical calculations and memory feats in his head – outdoing sophisticated computers! He can learn to speak a foreign language fluently from scratch in a week – eat your heart out teens sitting exams this term! 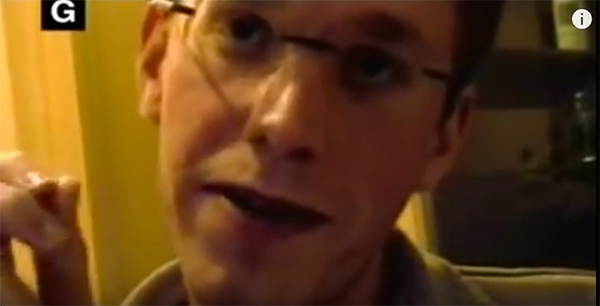 Daniel Tammet was born in 1979 on a Wednesday. ‘Wednesdays are blue, like the number nine or the sound of loud voices arguing.’ Remarkably for the times, both his parents understood his needs and patiently provided a secure and encouraging environment for him, indulged his obsessions and believed in him. What’s more, in spite of the extra care their firstborn required, they went on to have a further three boys and five girls, who, by their noisy and continuous presence, forced Daniel to gradually develop interpersonal social skills. Nevertheless, he would be completely thrown by small distractions – squeaking shoes, inexplicable reactions, noisy breathing, would lose him a game of chess which he would otherwise easily win. By the time Daniel was 13 he had eight siblings. By the time he was 19 he was ready to leave home and go abroad on VSO work. By the time he was 22 he was ready to live with his partner, Neil. By the time he was 25 he was ready to recite 22,514 digits of pi without error in public for 5 hours and 9 minutes thereby setting a new British and European record. So remarkable has his life been that he became the subject of a one-hour documentary, Brainman, filmed in Britain, the USA and Iceland in 2004. A year later he was confident enough to travel abroad unaccompanied, stay in unfamiliar hotels, stroll down unknown busy streets, and be interviewed for TV in the USA. He attributes much of his prowess to the constant unwavering love and support of his family, especially his parents. 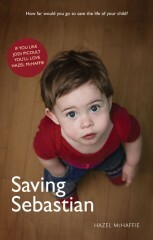 But reading his book you get an inkling of his own determination to overcome the odds. Born on a Blue Day gives a compelling glimpse into a unique mind and life. Precisely and carefully written. Sometimes stilted. Sometimes meandering through detailed descriptions, sometimes diffidently explaining the differentness of Daniel’s thinking. Always gently enquiring, shy and grateful. Much like the Daniel Tammet who comes across in the film. Not a lot to report of interest in the publication process at this stage – the work of promotion involves lots of emails and letters and phonecalls and the occasional interview. Not the stuff of riveting reports, then. Yawn, yawn. No spectacular coverage in Hello magazine; no prime time interview on TV’s Breakfast show; no six-figure deal through a top literary agent; no glorious battle for rights at the London Book Fair. Even I have to set myself timetables to ensure that I don’t lose momentum, and that I apply myself a few hours every day to the mundane practicalities, gaining readers one by one. 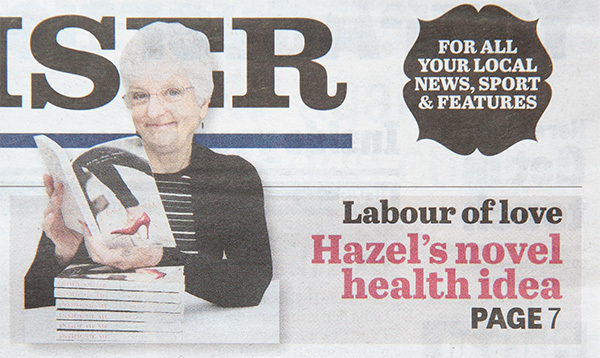 So imagine my surprise to find my face on the front page of a newspaper yesterday! With a bright red caption in keeping with that red stilletto shoe! Yeah! 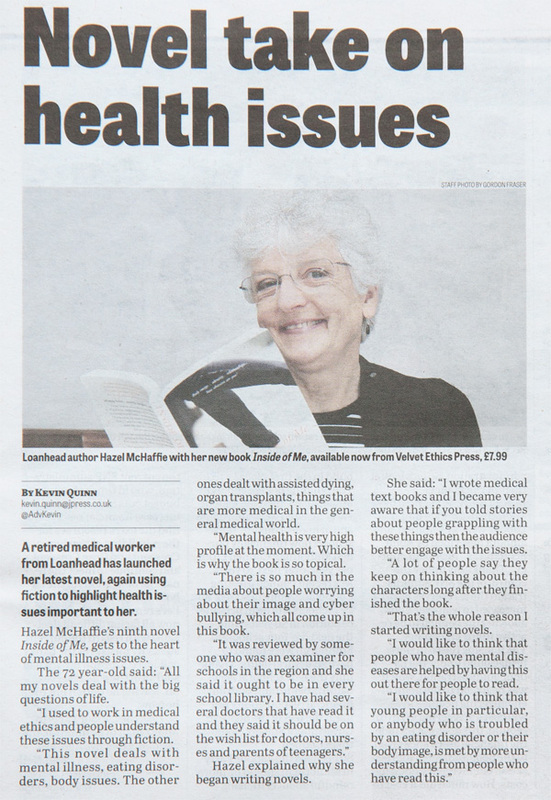 And there on page 7 a full article (with a different photo) talking about my use of fiction to highlight important issues thrown up by modern medicine. Now, as anyone knows who’s ever been interviewed, it’s terribly easy for one’s words to be distorted and convey a completely different meaning. This time half an hour of questions and answers has been condensed into 13 short paragraphs, so inevitably comments and connections have been omitted, other phrases repeated to preface a paragraph, losing the overall smooth flow of conversation to staccato reporting. But hats off to the reporter, Kevin Quinn, who captured the kernel of what I try to do: make medical ethical issues accessible and increase understanding and empathy. 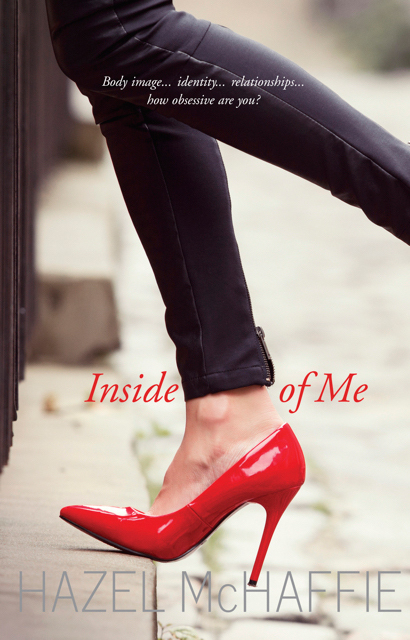 Hold back the hordes … form an orderly queue for copies of Inside of Me, guys! OK, OK, OK, I know. It’s only the local paper, the Midlothian Advertiser. But I’m chuffed that this particular reporter was interested enough in mental health to feature the news item as he did. That’s what it’s all about. They say no experience is wasted on a writer. Well, inasmuch as broadening horizons and sharing feelings and empathising with others goes, that’s probably true. But I think it’s also a fact that if we’re receptive we can make the most of unexpected opportunities life throws at us too. Last week, for instance, I had to visit my dentist. No big deal. Once there I didn’t have long to wait but long enough to read an article in Good Housekeeping about Jo Cannon whose recent (as of January this year) phenomenal success as an author has been emblazoned on Facebook. What I didn’t know was that she left school at 15 with one O-level in French, she worked at some pretty mundane jobs, but then decided medicine was the career for her. Hello? Ambitious then. Prepared to work jolly hard, too. She did indeed apply herself with huge determination, funding her studies by delivering pizzas at night, and finally qualified as a medical doctor at the age of 41. Wahey! What a triumph. Psychiatry appealed to her, but she was troubled by many of the cases she saw, so by way of catharsis, she began writing a blog. Success with that led her to do a creative writing course, which in turn led to a top agent taking her on, and terrific success with The Trouble with Goats and Sheep. And along the way she was always ready to use her experiences across the board to authenticate her writing. 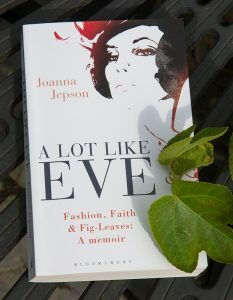 Her impending second book has attracted a seven figure sum. What an inspirational tale. All power to her writing elbow! Ten minutes in the dentist’s waiting room well spent for me too. Then, taking yet another break to wander in a motorway station to unravel my poor compressed spine on a long journey, I chanced on these two books by Holly Bourne: Am I Normal Yet? and The Manifesto on How to be Interesting. Now, I confess that YA books really aren’t my thing, but having just included a fifteen-year-old narrator with issues in my own latest novel, Inside of Me, I was curious enough to buy both of them. The style of writing swings between breezy, funny and poignant, capturing the everyday reality for youngsters grappling with teenage insecurity, bullying, obsessive compulsive disorders, self harm, illicit relationships. 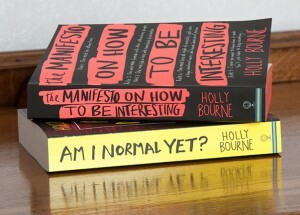 Holly Bourne is another writer who has used her own experience of life as a teen and a journalist and an agony aunt, to get inside the skin of her protagonists. As the heroine in TMOHTBI says: It’s material; it’s material; it’s material. Question is, what material can I get out of my current experience: promotion of my latest book ……? Well, here they are, still warm. 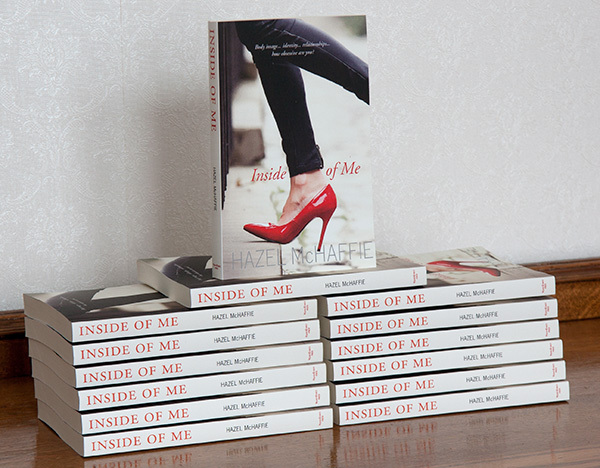 My first batch of Inside of Me. They arrived yesterday, bang on target. And as I hold the finished product in my hands, I’m enormously grateful to all those people who made this moment possible. To those who gave me the benefit of their wisdom and expertise, checking facts were correct and scenarios authentic. To those who provided their technical know-how and capabilities to ensure the final product looked so good. To those who encouraged and supported me through the entire process. To those who continue to believe in me, even – no, most especially – when I start to doubt myself. I salute you all. And I hope you can feel a sense of ownership too. You’ve earned it. There’s nothing quite like a spot of immobility to challenge one’s priorities. So much of who we are is wrapped up in what we do. If we can’t do, what then? Regardless of the accident, March was always going to be a weird time, a kind of cold turkey, waiting for the latest novel to come off the production line. No more tweaking. No more proof reading. What is, is. And most ‘next-jobs’ can’t begin until the book is actually available – next week! It’s surprisingly hard to concentrate when you’re in constant pain – or maybe I’m just a terrible wimp. And everything feels cack-handed. Imagine said author draped over an ironing board to write, read, eat, and you have a glimmering of the scenario chez moi. Just not being able to sit down becomes remarkably wearisome. Life gets reduced to essentials. Unfortunately ‘essentials’ includes a lot of travel right now – Ireland, Cornwall, Midlands, London, all within the space of three weeks. ‘Keep getting out of the vehicle and walking around‘, advises my expert osteopath. ‘Try reclining the seat and lying on your side.‘ Hmm. I guess it depends on the vehicle, and who’s driving, and how soon you want to get there. So, reflections it is then. The trip to Galway in Ireland was for an event about dying – both natural and assisted. 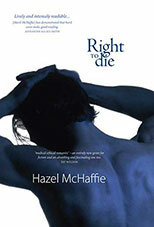 I was invited on the strength of my novel, Right to Die, and my background in ethics. Eire is working on a parliamentary bill on this subject right now so it’s a hot topic over there; it was an honour to be included. And I felt heartened. After eight years in print my little book is still borrowed from libraries large and small, and the topic is still relevant and controversial,. All very encouraging. Question is, encouraging enough to keep doing what I do? Hmm. Let’s see. Ahh. The tally says it all. 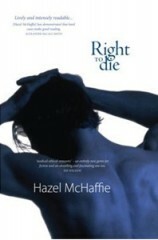 I might revisit this once Inside of Me is on the shelves and my back restored. Who knows, I might even reinvent myself and go for those four inch crimson stilettos! Well, here it is! 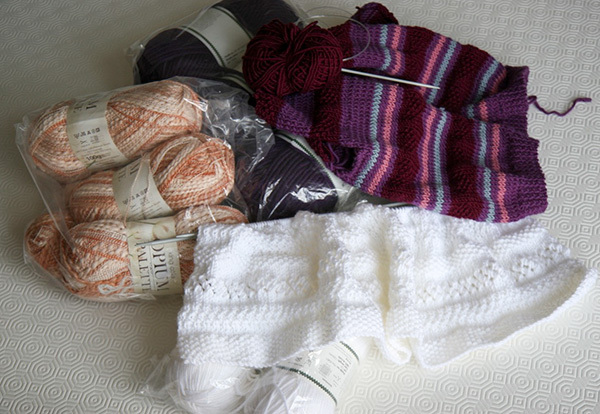 An exclusive sneaky preview. What d’you think, folks? 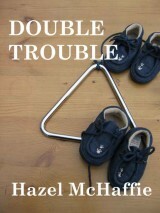 Would this cover jump out at you on the bookshelves? After all the work and determination that have brought us to this point, I think we can deservedly bask in the moment and give the entire blog post over to the image of the finished product. It should be available for purchase later this month.